The warp tension measuring head TMT is a useful tool for measuring the warp tension in the warp. 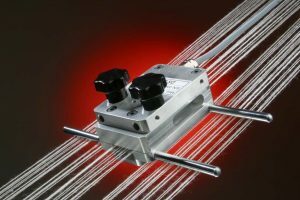 The measuring head can be integrated directly into the warp due to its simple structure. Additional mounting options on the measuring head allow easy attachment to the machine frame. The portable digital display TD-01 allows the visualization of the input signal either numerically or graphically. The operating time with four batteries is approx. 24 hours. Long-term measurements can be realized with a USB power supply. 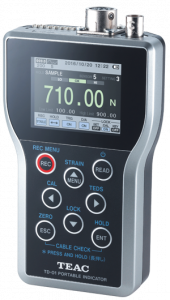 The portable digital display TD-01 has an LCD screen for the visualization of the warp tension measurements.